Merry Christmas to all of you who celebrate! I hope your festivities went well. We had a lovely Christmas Eve, with good food, nice company and enough presents. No yarn nor needles among mine, but a beautiful Japanese Donabe pot for cooking. 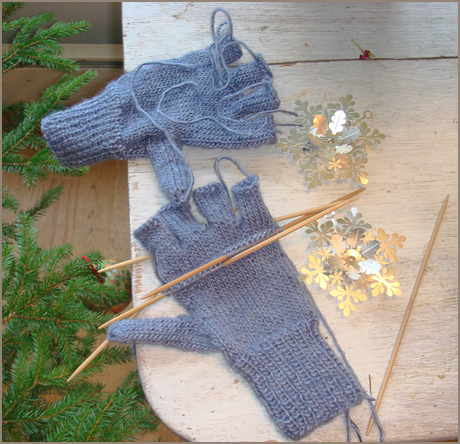 Almost off the needles already are the Urban Necessity mittens by Colleen Michele Meagher. My daughter wanted a pair of mittens that enables her to handle the bus ticket without problems, but are still warm. The Urban necessity mittens have a cap over the fingers, and fingers without tops. Handy! The yarn is Schoeller + Stahl Ronda, and I'm using 3,5 mm dpns in bamboo. 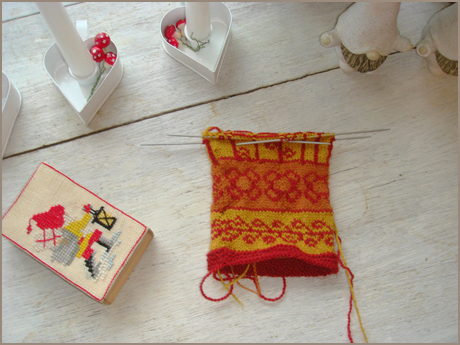 Both mittens are knitted, and I have today started to knit the first cap. 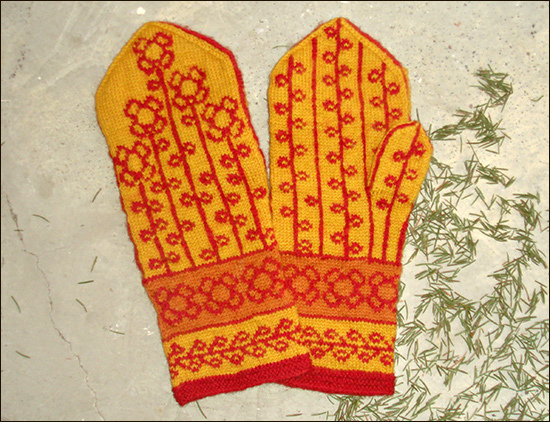 The second pair I have on the needles are the Vinterblomster mittens by Heidi Mork. 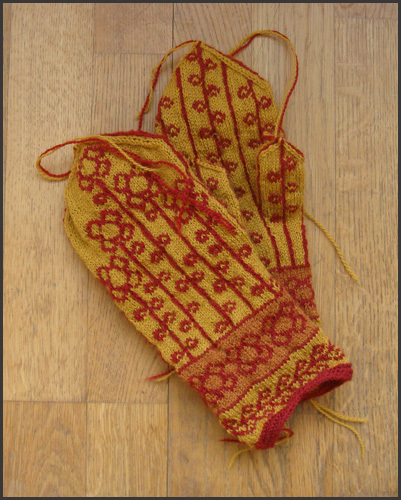 I'm using Vuorelma's Satakieli yarn for these mittens, in deep brick and ochre colours, on 2,5 mm dpns. This are intended for my younger daughter, but I'm not sure about the size, might be that they end up in my mitten basket. 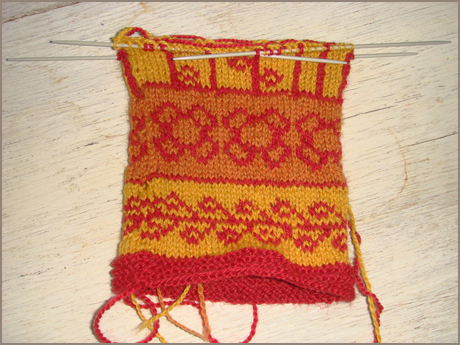 I'm just about to start the thumb gusset on the first mitten. Here is a close up of the pattern. 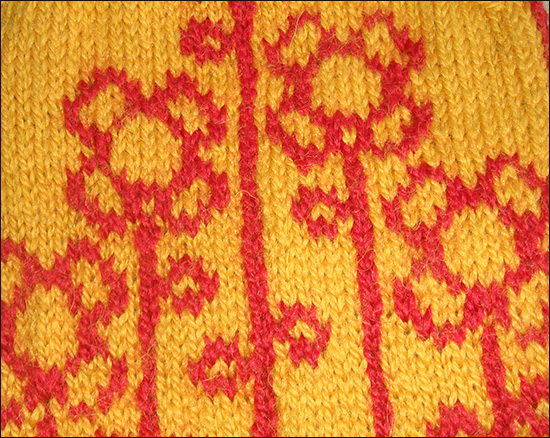 The observant knitter familiar with the pattern might observe that there is one flower less than intended in the second border. I forgot to increase stitches after the first border, but didn't realize it until I didn't get the main pattern to work out. So I ripped only a couple of rows and increased instead after the second border. The missing stitches were just the amount the last flower would have needed.